2018 has produced two favorable judgments – Vattenfall and iiyama – concerning the requisite tests to be satisfied by claimants in the Courts of England in order to withstand interlocutory challenges to the jurisdictional basis of claims. In the light of these recent judgments, this article will explore how the tests of “autonomous” and “territorial” jurisdiction apply to claims for competition damages in England. These two different forms of jurisdiction provide alternative but complementary purposes for claimants in establishing jurisdiction in the English Courts. In many cartel cases, England is an attractive jurisdiction due to its wide-ranging disclosure regime and the ability of the Competition Appeal Tribunal (the “CAT”) to hear collective actions on an “opt-out” basis. However, as the very ambit of establishing jurisdiction is limited by the application of jurisdictional rules, a forum selection exercise cannot be arbitrary. Unless the parties have agreed upon a conferment of jurisdiction to a specific court, the possibility to establish jurisdiction is predominantly directed by the domicile of those who have been found to have engaged in anticompetitive conduct as set out in Article 4(1) of the Recast Brussels Regulation No. 1215/2012 (“RBR”). In this regard, “domicile” is to be broadly interpreted as it includes the place of the registered office, the central administration and the principal place of business. The EU doctrine of “single economic unit” sets out that the notion that an “undertaking” should be widely construed, with a view to the “personal, tangible and intangible elements which pursue[s] a specific economic aim on a long-term basis” and thus which “can contribute to the commission of an infringement”. Accordingly, an action may be anchored by bringing it against a member of the economic unit of an addressee in an EU infringement decision, and in the jurisdiction where that economic unit is domiciled. In this regard, an “anchor” entity would usually be a subsidiary of an addressee, but not an addressee itself (and therefore a subsidiary of a defendant). This has the effect of expanding the list of potential jurisdictions with a view to the domicile of anchor subsidiaries. When an anchor defendant has been included in a claim, then the claim in respect of that anchor defendant is theoretically one of stand-alone and not one of follow-on. However, whether it is a stand-alone or follow-on claim, or a hybrid of the two – is irrelevant, as is consideration of what further evidence may be obtained and argued at trial in a strike-out/summary judgment hearing. Rather, what is important is whether the claim has a real prospect of success in the light of a decision finding. It follows that a claim for follow-on damages does not allow claimants to fully particularize their case vis-à-vis the anchor defendant and there is a presumption of generosity in favor of the claimant in respect of what is principally a stand-alone claim. Thus, the issue is whether the anchor subsidiary had knowingly implemented the cartel, and knowledge is capable of being imputed from the parent company having exercised a degree of “decisive influence” over its subsidiary. For claims brought in England, either in the High Court or CAT, a defendant may indicate its intention to challenge jurisdiction and the Court’s power to hear the claim as early as acknowledging the service of the claim form. This attracts an assessment of how the legal tests governing autonomous jurisdiction applies on a strike-out/summary judgment basis. Should the defendant(s) fail to indicate this intention early on and, instead, engage in pleadings, then this will likely be construed as a submission to the jurisdiction. However, as defendants are ever more focused upon identifying ways to challenge a claim at the outset, jurisdiction regularly presents the first opportunity to do so. Indeed, the application for pretrial summary judgment/strike-out in Vattenfall is the most recent in the body of English case-law to apply the above-discussed tests. In 2014, the EU Commission fined 11 producers of underground and submarine high-voltage power cables – used to connect grids and distribute electricity – for an almost decade-long cartel. The fines totaled almost €302 million. Several claims for follow-on damages were brought against the addressee cartelists and their subsidiaries. Crucially, the EU Commission adopted an infringement decision and not a settlement decision. Significantly, as an infringement finding, only a provisional non-confidential version of the decision has recently been made publicly available. Vattenfall, a Swedish power company that supplies energy in several EEA markets, is one of several corporate groups currently pursuing follow-on damages relating to the power cables cartel. Shortly after filing its claim in the High Court in March 2017 against two corporate groups of the addressees– NKT and Prysmian – including two English-domiciled subsidiaries that were not addressees in the decision (Prysmian Cables & Systems Ltd and NKT Cables Limited),– the defendants applied for summary judgment/strike-out of Vattenfall’s claim in June 2017 on the ground that Vattenfall could not argue that those anchor subsidiaries were liable for the damages caused by the cartel. Vattenfall argued that the two English anchor subsidiaries were sued on the basis of “knowing implementation” of the power cables cartel – attracting a two-pronged test requiring both knowledge and clear evidence of implementation of that knowledge. As regards knowledge, Vattenfall pleaded that it could not, without an unredacted copy of the decision, and in the absence of disclosure of contemporaneous documents, plead that either of the defendants’ English subsidiaries “knowingly implemented” the cartel. NKT attempted to refute this presumption in a witness statement that neither England nor the English subsidiary’s personnel were mentioned in the decision. However, this argument was firmly rejected by the High Court as “it can […] be reasonably expected that documents may emerge that may show assistance by D12 in relevant implementation and knowledge of cartel activities”. Accordingly, the Vattenfall decision may be treated as providing claimants with a presumption that an addressee’s subsidiary entities are privy to actual knowledge of the cartel. The High Court also set a low threshold for claimants by listing non-exhaustive types of behavior that would amount to the implementation of the cartel by an anchor subsidiary. This was perhaps driven by the fact that previous case-law had left this point open for defendants to exploit. Such behavior would include: (i) the provision of indirect sales; (ii) the involvement of employees in activities that fall within the scope of the cartel; (iii) the anchor entity being a “fiscal representative” of an addressee; and (iv) the anchor subsidiary dealing with customers on behalf of other group members. In addition, the Court essentially confirmed that there is no financial bar to establishing implementation because the £8,000 in sales made by the English subsidiary was considered irrelevant to the test. In sum, the High Court was satisfied by the mere fact that the English anchor defendants “should have foreseen” that they might become anchor defendants in England provided that they “knowingly implemented the cartel”. The High Court therefore has confirmed that issues such as causation and overcharge, which rely heavily on disclosure and the involvement of experts, are not capable of being answered on a summary basis due to the asymmetry of information available between claimants and the cartelist defendants at the time of filing the claim. Once jurisdiction has been obtained, there remains the question whether – as a matter of substantive law – the claim, namely due to the nature of the sales of the cartelized product to the potential claimant, falls beyond the scope of the rules that originally determined the infringement (namely Art.101 TFEU). This is essentially a question of territoriality and is one that arguably combines both jurisdiction and applicable law. Unlike the issues before the Court in Vattenfall, such a “pure” interlocutory application need not be raised by defendants when acknowledging service of the claim – but it should be sought as soon as possible. As a matter of international competition law, whether an English Court is capable of extra-territorial reach has been the subject of decade-old jurisprudence: a test of “implementation” which focuses upon the place where anticompetitive behavior is implemented, as opposed to where such behavior is agreed; and a test of “qualified effects” which looks at whether the anticompetitive behavior would result in “immediate, foreseeable and substantial” effects. The recent European Court of Justice Intel decision endorsed the application of the “qualified effects” test, ruling that it pursues the same objective as the “implementation” test. iiyama – a Japanese-domiciled electronics company – filed two claims in the High Court. iiyama had purchased monitors from television manufacturers and then shipped the products to its European subsidiaries, raising the issue whether iiyama had a right to claim competition damages as an indirect purchaser of the cartelists. On appeal from a split High Court decision, the Court of Appeal (“CoA”) held that there is no basis for strike-out/summary judgment dismissal when it can be shown that a cartel has been implemented, regardless of whether the cartelized product was sold directly or indirectly to the claimant. The effects of the cartel must not only have been “immediate, foreseeable and substantial” but also “systemic,” thereby satisfying the EU “qualified effects” doctrine. In determining whether there was “directness of effect,” the CoA declared that the “mere existence of even one prior sale to an innocent third party outside the EU at an early stage of the supply chain” is not enough to fail the “qualified effects” test. However, the CoA ultimately was persuaded by the fact that the cartels in question were intended to have a worldwide effect. iiyama therefore provides a persuasive precedent for claimants in England regarding the territorial application of Art.101 TFEU. Having suffered a defeat and with permission to appeal to the Supreme Court refused by the CoA, the defendants in iiyama sought to appeal the CoA’s decision directly to the British Supreme Court. However, permission was refused by the Supreme Court in July 2018 as the panel of Justices were unconvinced that the applications raised a point of law of general public importance. This alone confirms the high bar that must be met when appealing to the Supreme Court. It further bolsters the impetus of the CoA’s decision by crystallizing it as a precedent for the claimant bar. Similarly, in Vattenfall, the High Court refused the defendants’ application for permission to appeal to the CoA. However, the defendants have since applied to the CoA for leave to appeal and the outcome of the application is awaited. Nevertheless, both iiyama and Vattenfall provide clarification on the comparatively low bar claimants need to meet the differing tests for “implementation” across both autonomous and territorial jurisdictions. As such, a defendant’s use of interlocutory tools should not invite a Court to hear a mini-trial, as it has been previously noted that “there can be more difficulties in applying the “no real prospect of success” test on an application for summary judgment […] than in trying the case in its entirety”. It may be that the net effect of these two judgments will be to deter defendants from using jurisdictional issues as an attempt to reduce their liability for follow-on damages suits by maintaining the high bar that they must meet. At the same time, the two judgments provide further support to the starting position for potential claimants when pleading their claim, as the level of detail to be particularized regarding knowledge of implementation is low owing to the secretive operation of a cartel. As such, it remains “business as usual” in England as at least iiyama may now proceed to trial. The question remains whether there is such a thing as “proper” jurisdiction to balance the entitlement of claimants who are in pursuit of compensatory damages in England, and the rights of defendants who may be at risk of multiple jeopardy and over-compensation. However, the application of jurisdictional rules should not readily bar claims encouraged by public policy in England. This represents the underlying theme in both Vattenfall and iiyama. An unanswered, question is whether Britain’s imminent departure from the EU will prompt a change in claimants’ selection of a forum to litigate cartel claims. In the short term, the referendum’s immediate aftermath has not caused a sudden decline in follow-on claims in England. However, and notwithstanding how Brexit may transpire, the experienced English judiciary and favorable body of English case-law should nevertheless remain as positive and attractive factors for potential claimants. This article has been digested and revised from its first publication in the “International Comparative Legal Guide to: Competition Litigation 2019” (11th Edition) (Global Legal Group Limited). See Vattenfall AB & Others v. Prysmian SPA & Others  EWHC 1656 (Ch). See The LCD Appeals  EWCA Civ 220. References to “England” and the “English courts” are to be construed as references to England and Wales, respectively. See Case T-11/89, Shell International Chemical Co v. Commission  ECR II-757, at . That is a claim that does not rely upon a decision/finding of the EU Commission and/or a National Competition Authority for the purposes of establishing an infringement of competition law and, therefore, the liability of those involved. A distinction must be drawn between Art.288 TFEU, on the one hand, which holds that a decision of the EU Commission is only binding upon those “to whom it is addressed” and the ability of claimants, on the other hand, to sue an anchor defendant in order to file a claim against the addressees where the addressees themselves are domiciled in a different jurisdiction. See Bord Na Móna Horticultural Ltd & Anr v. British Polythene Industries Plc  EWHC 3346 (Comm). See Nokia Corporation v. AU Optronics Corporation  EWHC 731 (Ch) at [62–67]. Power Cables (COMP/39.610) (2 April 2014). See, e.g., Britned Development Ltd (Claim Number HC-2015-000268), National Grid Electricity Transmission (Claim Number HC-2015-000269) and Scottish Power (Claim Number HC-2015-000275). See Vattenfall’s Particulars of Claim at paragraphs  and . The defendants in iiyama had submitted to English jurisdiction by engaging in pleadings. See Ahlström Osakeyhtiö and others v. Commission of the European Communities (C-89/85 A)  ECR. 1-5913. See Gencor Ltd v. Commission of the European Communities (T-102/96) EU:T:1999:65. See Intel Corp v. Commission (C-413/14 P) EU:C:2017:632 at . CoA case references A3/2018/2047 and A3/2018/2065. See Doncaster Pharmaceuticals Group Ltd v. Bolton Pharmaceutical  EWCA Civ 661 at . 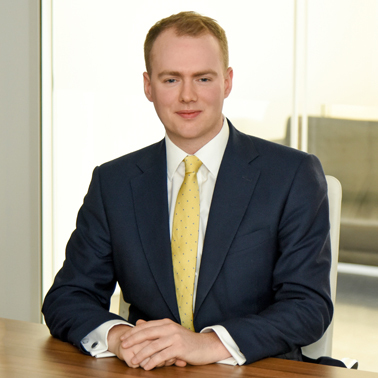 Scott Campbell is a partner and Luke Grimes is an associate in the London office.